Through some business dealings I met an archer I respected in many ways. Once he told me something about life I will never forget. "In life you spend twenty years learning, twenty years doing, and twenty years teaching." Let me add to that last 20 years "giving back". I'm in the giving back mode to the sport I love and am looking for bowyers to give back to our great sport. Bit my tougue, the greatest sport. I'm looking for bowyers to donate bows to the PBS (Professional Bowhunters Society) Youth Bowhunt Raffle. ALL the proceeds from this raffle will go to fund the Youth Hunt for 2011. What better way to give back to our sport than insuring its future by sending a youth on a hunting trip? JJwillis and I discussed the best way to start this thread and decided to explain a few things. It is actually called the Young Bowhunter Program - Youth Leadership Hunt. The PBS Council members select the youths who are required to submit a bio, essay, grades and hunting experience. The council selects sometime in March. This hunt travels from state to state. I will try to get council members to add to this thread describing past and future hunts. 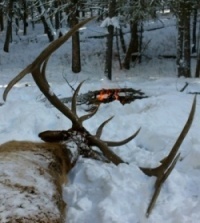 Hopefully we can get someone who knows about the Utah elk hunt of last year. Maybe even some of the participants. Becides the satisfaction of donating to a great cause bowyers are allowed to run an add in the PBS magazine. This raffle is concluded with a drawing at the Odd Year Gathering held at Ojibwa Bowhunters New Berlin, WI July 15, 16, 17, 2011. Everyone is invited to this great event at a great range. Ever hear of a 3-D range for broadheads? Bring 'em, just one of our ranges. To be a bit more specific about donations - it's up to you. The '09 Odd Year Gathering was also held at Ojibwa and we had bowyers who built bows that were displayed at the Gathering. We also had bowyers who donated a bow, but built it after the Gathering to the winner's specs. Let me add here that we had arrowsmiths and a custom knife maker jump on the donation band wagon. I think a lot of guys would be receptive to this. This forum does not get much traffic and you can see there are only 77 "looks" at this post....I'm sure many of them guys that dont even build bows. I am not sure I"ll even have a bow ready for WTT this year, but if I do, I would consider donating it to the cause. If not, I will TRY to have a kids bow or something to send down for the raffle.